Our new book "Swedes at War 1945-2015" is the first history of the post-WWII volunteers from Sweden in foreign units. 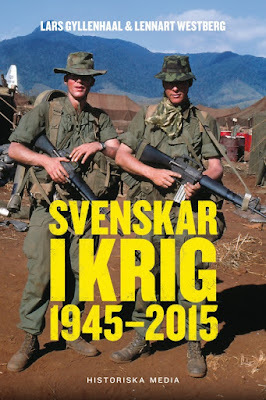 At the end of 2015 I am pondering the fact that since our book Swedes at War 1945-2015 was published this fall yet more Swedish citizens have died for jihad and the latest statistics from Sweden´s security agency Säkerhetspolisen mean that more Swedish citizens have now died for jihad than for Hitler. As Lennart Westberg and I wrote in our previous and also translated book, 28 Swedes died in the service of Hitler´s Waffen-SS and Wehrmacht (26 in the W-SS + 2 in the Wehrmacht). In late 2015 it became known that about 40 Swedish citizens have died in various groups fighting for jihad in either Syria or Iraq. However, if one looks back at the very first Swedes who died for jihad in different states (not just in Syria and Iraq), as we do in our new book, the total figure today is no doubt above 40. Because already in 1993 Mikael Glinka from Stockholm died for the sake of jihad in Bosnia. In the 1990s there were also Swedish citizens who died in combat in e.g. Chechnya. So, as 2015 moves fully into history, I wonder why my state and society has been so slow to pick up the implications of jihad. Well, not only jihad, but challenges to our security in general. How was it possible that we scrapped most of our security thinking and military and civil defence capability? To end this last blog post of the year with something positive I could of course add that the current Swedish government in late 2015 decided to bring back Swedish "total defence" planning in some way. But the very late hour and lack of extra funding also weigh heavily. If you are wondering how many Swedish citizens died against Hitler - well, there is no exact figure but it is clear that many more died against than for. In the various Allied convoys (to Liverpool, Murmansk etc) some 900 Swedish seamen died. In addition there were Swedish citizens in US, British, French, Norwegian etc army, navy & air units and approx a hundred were killed in action. For more about the Swedes on the Allied side I again refer to our previous book Swedes at War 1914-1945, also available in English.